Note: Site moved to https://beacon.avesya.com/digits/. Content is left here to avoid breaking links but will become stale. Since the RAND Corporation seems to take the position that their canonical table of random digits is their property,1 here is a drop-in replacement. The formatting and statistical properties of these digits are identical, but the numbers themselves are independently generated. Unlike the RAND Corporation, I concede that there is no creative content in these tables and therefore they are uncopyrightable. I further dedicate any copyright interest I may have in these tables to the public domain (although I do not believe that there is any copyright interest for me to relinquish). You may redistribute, modify, or use these tables for any purpose whatsoever. 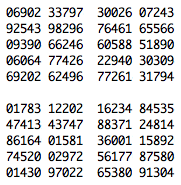 Update: I have discovered that the copyright—such as it is—has lapsed on 21,875 of these digits. Enjoy. The random digits were generated by taking bytes off of /dev/urandom on an iMac G4 running Mac OS 10.4.8, discarding those greater than 249, and keeping the last digit. Finally, the resultant million digits were added modulo 10 to the canonical RAND digits, ensuring that they are no less random. The original normal deviates (deviates.txt) were computed with a different technique from RAND and are not related to the digits. The entropy source for these was /dev/urandom on the same machine, XOR'ed against random bytes from random.org. Slightly more than 8 bytes of entropy are used per deviate in a simple rejection technique. Random integers are converted to double-precision floats in the range [0,1) by dividing the thirty-two bit integers by 2^32. Darts are thrown at the normal probability density function from -5 to 5 by selecting a pair (x, y) = (10*random_double() - 5, random_double()). If the dart lands beneath the curve, e.g. y < (1/√ 2π )e-x2/2, the x value is kept as the deviate, otherwise, it is discarded. There is no detectable bias from eliminating the tails beyond 5 standard deviations because no deviates this extreme can be expected in a sample size of 100,000. The second set of normal deviates (deviates2.txt) were derived from half of the random digits using the same method as the RAND deviates. Specifically, a five digit block D is used to compute one deviate by using the formula √ 2 erf-1(2(D + 0.5)10-5 - 1). (erf-1 is the inverse error function.) The left-hand five columns of the digits are used to compute the deviates in the following manner: The first 10,000 rows of the first column of digits are used to compute the first column of deviates, the second half of the first column of digits is used to compute the second column of deviates and so on (column 2 of digits yields column 3 and 4 of deviates, etc.). 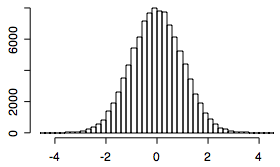 This distribution has a Χ2 value of 8.37 with 9 degrees of freedom, with a probability of 0.497. The original normal deviates have been extensively tested with the Shapiro-Wilk test for normality. No biases have been found. 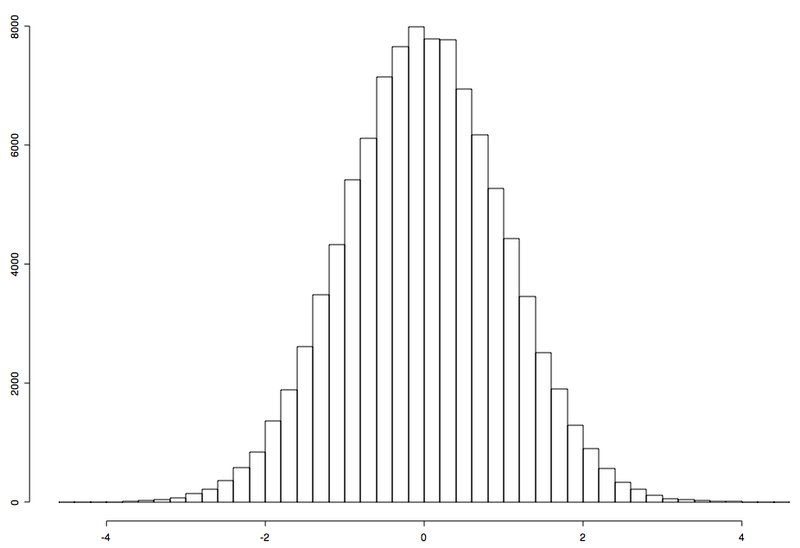 The sample mean is -0.005 (P=0.11) and standard deviation is 1.0008 (P=0.72). With a sample size of 100,000 deviates, each 5-digit block is expected to occur once on average. The result is that each of the above deviates is produced on average once in a sample of 100,000 deviates generated by this method—and no others in this range. So both the RAND deviates and deviates2.txt contain multiple instances of 4.417, as well as other deviates listed above, but no deviates in the gaps from 4.174-4.416, 4.057-4.172, etc., an obvious bias. Since 4.3... is expected but can never be emitted, the RAND technique using only 5 digits of input has detectable bias at the tails even at one decimal place. The RAND analysis of the tails (Table 8 of the introduction) looks only at bins with an expected value of 25, which is not sensitive enough to detect this bias. See this excerpt from an email exchange between myself and the RAND Corporation. right for others to distribute the info. Random Digits with 100,000 Normal Deviates." tables as they see fit.